Portland, OR home stagers David Peterson & Nik Murrow have been two of my top home staging professionals for years. Their work is clean, sleek, and stunning. They have the kind of aesthetic that you immediately know it’s them when you see the photos. 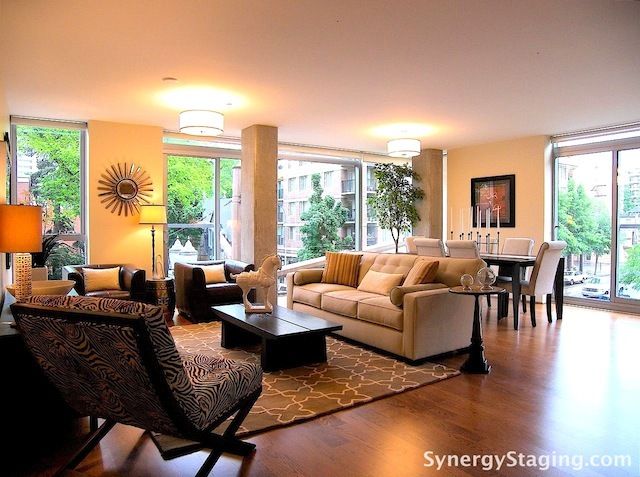 I’m excited to have the opportunity to tell their home stager story. Why did you decide to become a home stager? My partner and I moved from LA to Oregon. He was working as a Costume Designer in LA and we were looking for a new opportunity. After speaking with our Real Estate agent we learned of Home Staging which was a great way to incorporate Nik’s design skills and my experience in Real Estate. What did you do before you were a home stager? I worked in the music industry for 15 years as a personal manager. I had also been an operations manager for a Property Management Company as well as a high end IT Networking Company. Tell us a little about your business, how it operates and who your clients are: We have a boutique business that specializes in vacant home staging, although we also do occupied homes and Redesign as well. We use exclusively our own inventory and service the Portland Metro area. Our design aesthetic has a modern flare with a full, lived-in look. The rewarding part of the business is to approach each property with a unique design while avoiding a result that is cookie-cutter and ‘staged’ looking. The majority of our clients are investors, banks, and Realtors. We have noticed that more individual home owners are beginning to contact us again as the market begins to reinvigorate. What’s your favorite part of the business? Seeing the transformation of each property. No matter how many homes we stage, witnessing a property transform from cold and vacant to warm and inviting never gets old. And then this is followed by the reaction of our clients and ultimately, the satisfaction of helping them sell their home quickly, while allowing the buyer to experience the best way to live in their new home. What’s your least favorite part of the business? Getting to a property that is not Stage Ready. Remember, we are not professional cleaners! Who are some of your favorite stagers? This question isn’t fair – there are too many to list! Aside from our many talented Portland colleagues and friends – the first that come to mind are Jackson West, Ryan Dressel, Matthew Finlason, David Cieslak, Kathy Nielson, Margaret Gehr, Michelle Minch, and Annie Pinsker-Brown just to name a few. Tell us about your best staging experience. We have been staging in a development with new construction for several years. The first home had been on the market for many months and after staging it sold at the first Open House. Each time a staged home sells we stage another house in the same development. Inevitably every home that is staged has sold quickly at asking price. This partnership has been very rewarding and successful. It has led to many other projects with the same client. Tell us about your worst staging experience. In December 2008 we were having record snowfalls in Portland. We were scheduled to de-stage a property on December 22 that had sold and was scheduled to close on 12/31/08. Unfortunately the closing got moved up to Christmas Eve and we couldn’t get to our warehouse and the truck was snowed in. We agreed to drive to property in our CR-V, 30 miles away, and move the staging into the garage since we couldn’t drive our truck. We then had to schedule another date to pick up everything from their garage. Needless to say, the new owners were happy, but spending hours each way on the freeway was not our idea of a fun Christmas Eve. Here’s a blog post with more details and photos! What was your favorite room or art or accessory? (if you have a photo, please include it) There are so many to choose from, but the attached photos of some of our staged living rooms are among our favorites. What would you tell someone new, thinking of getting into home staging? It can be a very rewarding profession, but it is not glamorous and is more physically intensive than you’d expect. When investing in furniture and décor, make sure you have a clear vision on your design aesthetic. Don’t just buy lots of things because they are on sale. Investing in fewer nice pieces will ultimately give you a more satisfying stage. 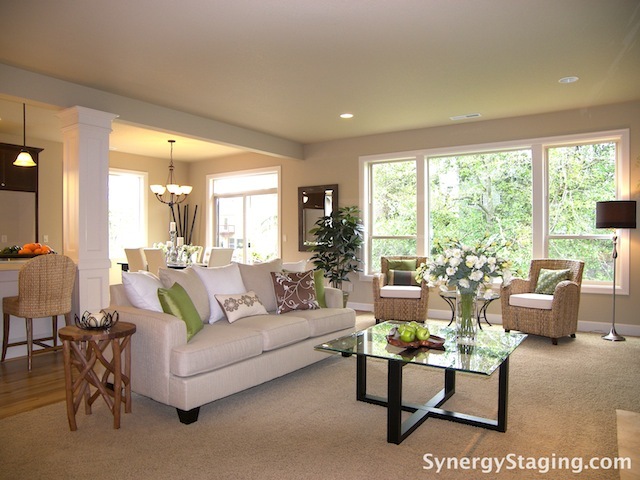 Connect with Synergy Staging on facebook or twitter. 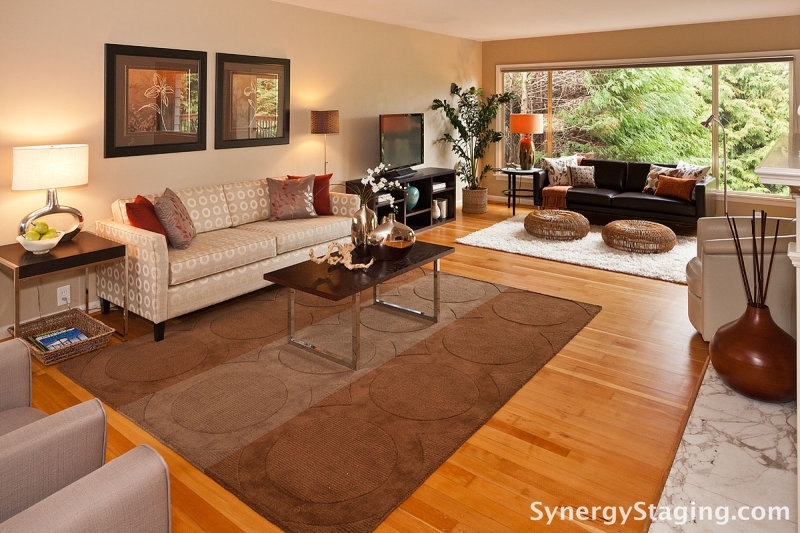 Learn about home staging with Synergy Staging.